Spoilers ahead for Ancillary Justice (reviews here and here – yes I loved it enough to review it the second time around) and Ancillary Sword. Sooo… first thing to admit: it took me reading someone else’s review to realise that Justices, Swords and Mercies are all the sorts of ships that Breq is in charge of. How embarrassing that I did not realise that. Secondly: yes, I love this series, I love Leckie’s work, I love Breq and the world she inhabits. My love is true and remains unshaken. Further note: I’m just going with ‘she’ to refer to everyone, when I have to. I think there’s one person whose gender is actually confirmed (… maybe…insofar as that ever can be in these books) and it just does violence to my brain to go with he/she when Leckie herself (ahaha) goes with SHE. So nyer. 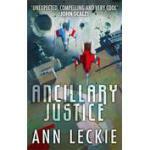 Spoilers for Ancillary Justice (first review and second review). I loved this second book possibly not quite as much as the first, for which my love burns for its originality as well as its characters and action; but it’s a true love nonetheless, for a book once again dealing with complex issues without making them un-complex, and for characters who aren’t cardboard, and a plot that – stripped back – is really very straight forward but that kept me reading voraciously. The issues are similar to Justice, as you would expect, although with a different emphasis. Of course the gender aspect is still there; yes I still found myself wondering whether that deadbeat was female or male, that that leader a man or a woman, and so on. A little bit less than when reading Justice, I hope, since I read this immediately after my re-read and I was a bit more in practise of just reading ‘she’ and remembering that genitalia is irrelevant. More importantly, and indeed driving the action to a much greater extent than in Justice, are the twinned notions of imperialism and colonialism. How does an empire genuinely make sure all of its new citizens are treated like the old ones? How does an empire deal with pre-existing racial and other tensions that are going to manifest even though you’re all now officially the same? And then you add corruption to the mix and of course things will not be pretty. And THEN, into that mix, you add someone new – someone with a powerful sense of justice – and you watch how things fall, and which things blow up. It amazed me to discover that Leckie is an American, what with her Radchaai obsession with tea. Breq continues to develop across this novel. Justice saw her get some form of justice, and then has her direction changed by Mianaai herself. She has more time, here, to reflect on the pain of losing Awn, and the pain of losing the majority of herself; there are some intriguing moments where Leckie thinks through what it would be like to be that one, remaining, very small part of something previously so large. How does that one small segment develop an identity? Does that experience bestow compassion or impatience with others experiencing similar issues of dislocation? My prediction for the third book: it will have to deal with the alien Presger, as well as the outcome of the civil war within Mianaai herself. In fact, I don’t really see how this can be resolved in just one more book. MOAR BOOKS, LECKIE. This is my second time around in reading this book. 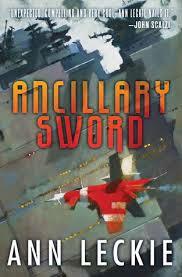 I knew I needed to reread it before reading Ancillary Sword. You can read my original review over here. I still found the almost exclusive use of ‘she’ to be quite disconcerting, and I feel like I noticed those few times that someone is ‘properly’ gendered more than I did the first time I read it. I still found myself trying to pick gender clues from behaviour and descriptions, which of course says something about me… and also quite a lot about Leckie, since I really don’t think she enables such a reading of anyone. I have absolutely no clue what sort of genitalia Lieutenant Awn had. Because I wasn’t so staggered by the gender issue this time I believe I felt the imperialism/colonialism aspect more. The Radch is a monumentally arrogant civilisation – and I felt very keenly those discussions about how such a sentence would be constructed in their language, since the word for ‘civilised’ IS the word FOR their civilisation, and for themselves: Radch. So this arrogance, this narrow vision, is constructed into their language – while I’m not a complete subscriber to the notion that language creates reality, it certainly has an impact on our perception of such. Leckie herself notes the similarities between the Radch and the Roman Empire, which is useful both for the yes and the no. Make new peoples citizens, subsume/ align their gods with your, but use ‘corpse soldiers’ to help make it work and have a bunch of apparently random cultural hang-ups. I loved the gloves thing this time. I could drive myself mad trying to figure out how a culture develops a horror of bare hands except in the most intimate of circumstances. I’m not sure I noticed the descriptions of skin colour last time (oh the advantages of being white). Much like the people of Earthsea, the Radch are dark-skinned… which is neither here nor there in the book’s greater scheme of plot and character and theme, but is nonetheless important in the greater scheme of, you know, the world. Another aspect I feel I appreciate more deeply this time around is the religion. Everyone, basically, is religious. All of the ships are named after religious figures; all of the decades of soldiers likewise. There is an expectation that senior soldiers will pray and cast the omens each morning. Each new planet has their own religion whose parallels with the Radch’s own must be found – and there’s even discussion of a problematic, exclusively-monotheistic bunch who have caused issues in the past, who basically appear atheist to the Radch: either horrifying or bemusing, depending on your attitude. Not everyone is especially devout, but there is no doubt in anyone’s mind that religion belongs in humanity and in space and everywhere there are humans. This is refreshing. Finally, the plot. Even though I did have some memory of how everything was going to play out (that notorious memory of mine), I still found it gripping. The massacre of civilians to the death of Awn, the gradual change in Seivarden, the drama at Omaugh: it’s not the most fast-paced space opera I’ve ever read, but it is definitely compelling and in no way just a vehicle for discussing Important Issues.